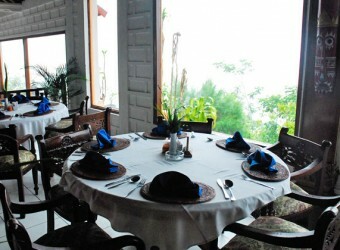 Bali Gunawan Restaurant is a large restaurant located in Kintamani. In clear weather, visitors can enjoy Indonesian buffet while overlooking the magnificent view of Mount Batur and Lake Batur. The restaurant offers nasi goreng and mie goreng, also a wide choice of Indonesian foods including sate, gado-gado, pork dishes, etc. Many types of desserts are available.